We have an important communications dispatch to issue here at Starfinder HQ: we're working on a Starfinder Beginner Box! 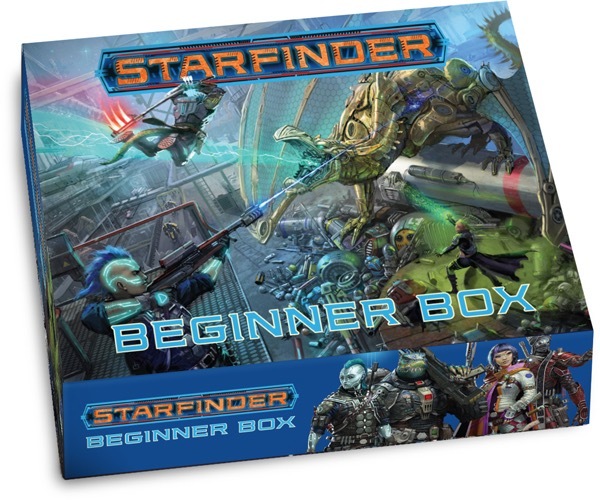 Come spring 2019, you'll be able to get your hands on a box with all of the components needed to quickly learn and play the popular Starfinder RPG. From dice, to maps, to pawns, to separate books for GMs and players, this box is meant to provide a self-contained gaming experience for those with little to no experience with Starfinder—or with tabletop RPGs at all. Work on the Beginner Box is still churning apace back in our office in Redmond, even as the project's design team is bustling around Indianapolis at Gen Con. In addition to our team's game design work, at this very moment we have the best production crewmembers in the business dedicated to making this product as awesome as possible. We just announced this project at our Starfinder 101 panel at the convention, but we realize that legions of interested parties are not in Indianapolis. For those who couldn't make it to the show, check out the Starfinder Beginner Box cover that we revealed below! If you'd like to see the seminar where we announced this project, go to the Paizo Twitch stream and find the video for the Starfinder 101 panel. In the meantime, stay tuned in the coming months for more information about the Starfinder Beginner Box! This looks like I can actually introduce new RPG players to Starfinder. Core Rule Books for gamers are way too intimidating for newbies! I bought the commemorative CRB for Starfinder, and couldn't get my friends to slog through it even enough to make a character. I like the box art. Good to see Obozaya get some air time instead of Altronus for once. Huh, cool. Will this be part of one of the subscriptions, or a standalone product? Where is the store page to preorder? No preorder up just yet, but once it is, we'll broadcast it far and wide! To ensure you don't miss that announcement if you're not keeping your eyes on the blog, you can sign up to receive emails from us (you can do that under your account here) or follow us on social media (our accounts are linked in the footer of the site). But the post mentions to Preorder now? That cover is so fresh that I hadn't even seen it! I remember when Pathfinder Beginner Box came out there was a special PFS event at launch. Might be a good idea to do the same thing with this product if possible. No. I will not date this book, I've too much to do. Wow, didn't see that coming. Good news, though, as the Pathfinder Beginner Box was a spectacular product. So, what will we need to do to run it for organized play? Will there be a beginner box bash? Will this be a part of a subscription plan, and if so, which one? The Beginner Box will not automatically be sent to subscribers, but if you have a Starfinder Roleplaying Game Ongoing Subscription and you preorder the Beginner Box, you will receive the PDF for free when your preorder ships. Yes, but how many of those air time heroes have been female lizard people? Murder hobos are still murder hobos, but the clubhouse no longer has the "no lizard girls" sign on the door. I hope the rule books in this are just condensed versions of the rules not weird new rules like the PF Beginners Box. I feel like you somehow got a different beginner box than I did. I got the BB from humble bundle, perhaps it was an updated beginner ruleset? It was missing tons of stuff, to the point I just played it with full rules. No aoo, concentration for spells, combat manuevers, it was missing some skills,no armor check/Max Dex on armor, monster blocks were just bad etc etc. They had a transition guide for a reason. You can find more comprehensive discussion about it with a Google search and or on Reddit, but like TheSilverKnight said I hope it's a quick and dirty on how to play, but not by omitting core aspects of gameplay. There weren't any new rules in the Beginner Box. They simply streamlined the learning by removing some of the old ones. Personally, I had great luck introducing people to PF using the Beginner Box rules, especially the small 64-page Heroes' Handbook. I seriously hope that the Starfinder Beginner Box is created using the same design principles. A quick-start set of rules; all the pawns, dice, minis and maps that you need to run a game, and a GM manual designed to teach you how to teach other people to play. It was an awesome intro; I hope Starfinder gets something similar. Absolutely, 1,000% agreed. Keep it simple. Keep it direct. Make it for kids, but in such a way that adults can use it. I liked the Pathfinder Beginner Box because of the great design and graphics. Also because everything you needed to play was included: Rules, dice, flip-mat, pawns, character sheets etc. - The value was great, as was the presentation with symbols and clear explanations - no overcomplicated rules language. That being said, it was a little over-simlified. The good thing about Starfinder is, that the rules are already streamlined from Pathfinder. I still think that "combat maneuvers" against KAC+8 or high level feats and items won't make it into this box, for obvious reasons. The Pathfinder Beginner Box had only the 4 "classic" classes iconics (Cleric, Fighter, Rogue, Wizard). The Starfinder Beginner Box shows 5 iconics on the box art: Envoy (Bard equivalent), Operative (Rogue), Solarian (Paladin), Soldier (Fighter) & Technomancer (Sorcerer/Wizard). Personally i would ditch the Solarian for the Mystic (Cleric), as it is to complicated with atunement for a "Beginner's Box" & a healer is much more essential to learn/play. The only thing i am curious about is: Will this contain Starship Combat? A regular sized hex-mat (on the backside of the flip-mat) would suffice and the higher level maneuvers wouldn't be needed. Also a great opportunity to sell the prepainted minis, like with the very first Iconic Heroes four-pack, which i replaced the player characters pawns with back in the day. The kids liked it that their characters were real minis to differentiate them more from the creatures. I will definetly buy this and use it to introduce new players to Starfinder. It will have a 96 pages (same as Doomsday Dawn) Heroes Handbook & a 96 page Game Master's Guide, 7 dice, 80 pawns, a double-sided flip-mat, 6 pre-generated characters, 6 blank character sheets & 6 rules reference sheets. The decision to extend the pcs to six classes is great imo and i can see why the mechanic wasn't included (mechanic & drone are two playable characters basically). Very exciting! I am hopeful this will help get some of our PFS regulars interested! Will we see this at our local Target stores? The image on the blog is pretty much a mock-up at this point and isn't indicative of the box's contents. Stay tuned for future updates! Is Paizo going to also release mini adventures similar to the Beginner Box Demos? The article says to go to Paizo's twitch but twitch.tv/paizo returns nothing. Why would this info be omitted if it wasn't the obvious twitch choice of "paizo" ? The seminar recordings will be released by the Know Direction team sooner or later, so personally I'm waiting for that.